The most famous wood carvings in Fujian, the very southern part of China, are primarily made from the Longyan (Dragon-eye) tree. The wood grows mainly in Puxian area which is hard and has its special grain. Local masters in Fujian have been making highly skilled objects like furniture, Buddha statues and Guanyin figurines since the Ming (1368-1644) and Qing (1644-1911) dynasties. Besides, masters also use the Longyan roots with its natural twisting and rough node characteristic and transform them into amazingly intricate sculptures of birds and snakes living in trees, as well as mythical beasts from Chinese legends. At the same time, Longyan woodstand craft emerged and literati were amazed by its fabulous wood grain, the unique tiger stripes. Especially in Ming dynasty, the period of “naturalism”, people preferred natural grain than artificial carving. Masters kept the upper panel as uncarved for presenting its natural beauty. The stand below is one of the fascinating examples. 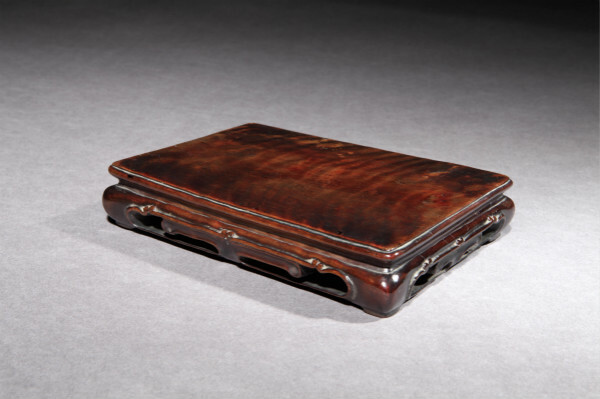 Carved from a single block of good-looking Longyan wood, this rectangular stand has a purely undecorated top but decorated by its natural and perfect dark Longyan wood grain. This upper panel is raised on a wide indented waist with horizontal recessed moulding. The stepped shoulder is supported by four joint feet with simple-designed but very elegant aprons between them. Moreover, the archaistic low-lying design of this stand with plain and crisp moulding suggests its Ming date. The stand is very rare because of its uncommon material and its early date, and also well designed by craftsman to show its original beauty of the wood. So far, Longyan wood stand such as the piece above is a kind of new collection which gets more and more attention. Different from Zitan and Huanghuali, the most precious wood in China, Longyan wood is affordable and worthy to collect. With its adorable grain and simple but elegant design, it is no surprise that Longyan wood stand will be more and more popular in the near future.